Assessing selection for antibiotic resistance in the natural environment. Established theories suggest that selection for resistant bacteria usually occurs in the human body, when a patient is under antibiotic therapy. However, recent research suggests that low concentrations of antibiotics and other compounds in the natural environment could drive selection for antibiotic resistance. This study is investigating the role that environmental pollutants can play in selecting for antibiotic resistant bacteria. As part of this research, Dr Lihong Zhang is engineering pairs of E. coli strains that are identical apart from the presence of a single resistance gene. 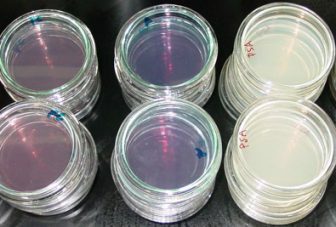 This approach is allowing competition experiments to be carried out in the laboratory – to examine whether carriage of the resistance gene allows one strain to outcompete the other, even at the extremely low concentrations of antibiotics seen in polluted environments. The findings of this research will feed into evidence that will enable regulators to determine safe environmental limits of antibiotic residues. More information will available on this project shortly.